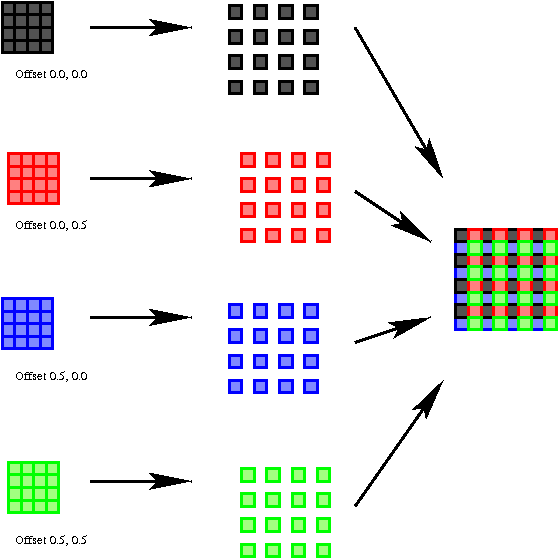 Interleaving consists of creating an output image that is a regular interwoven pattern of all the input pixels. This is done by using the WCS parameters from the astrometric calibration since the offsets have to have been accurately carried out for this sub-sampling to work. Also, the PSF must not have varied much between the exposures for microstepping to have been useful. A not unexpected consequence of interleaving, which is used in an attempt to recover lost sampling, is the resulting spikey PSFs due to seeing variations between the component images. 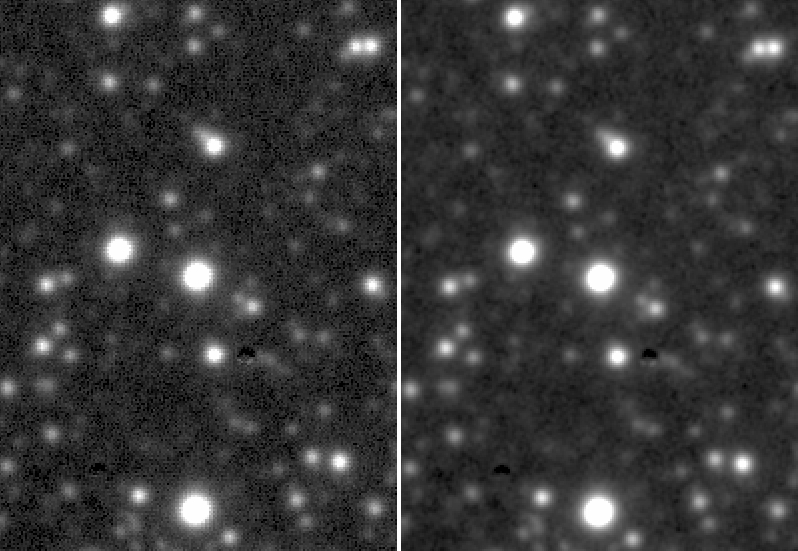 The PFSs stubbornly remain spikey even when many interleaved sub-frames have been stacked, which can lead to problems for many detailed analysis packages e.g. PSF fitting. There is a simple optional solution that vastly improves the appearance of these stacked products with the (minor) disadvantage of introducing correlated pixel noise (see figures below). This procedure we have nicknamed "dribbling" since it is closely related to, but not quite the same as, the more conventional "drizzling". Indeed if you went to all the effort of going back to the individual component frames and drizzled them onto the final grid you would end up with a remarkably similar result, with similar correlated noise. So how and why does dribbling the final stacks work ? Interleaving exactly preserves the original pixel flux information and relative location on the sky. This is true even during deeper stacking of many interleaved WFCAM frames since they are offset by integral numbers of pixels. Providing the offsets are small, i.e. within ~10 arcsec, field distortion is not an issue and the CASU pipeline can therefore make use of nearest-neighbour pixel stacking. This, of course, exactly preserves the individual stacked interleaved components. In the resulting stacked image we then make use of the fact that the real pixels are 0.4 arcsec in size and overlap the neighbouring pixels in a 2x2 (or 3x3 if used) interleaved 0.2 (or 0.133) arcsec grid. Or put another way, each pixel in a stacked set of interleave images (e.g. 0.2 x 0.2 arcsec) actually contains the flux of a pixel that is 0.4 x 0.4 arcsec centered on that position. 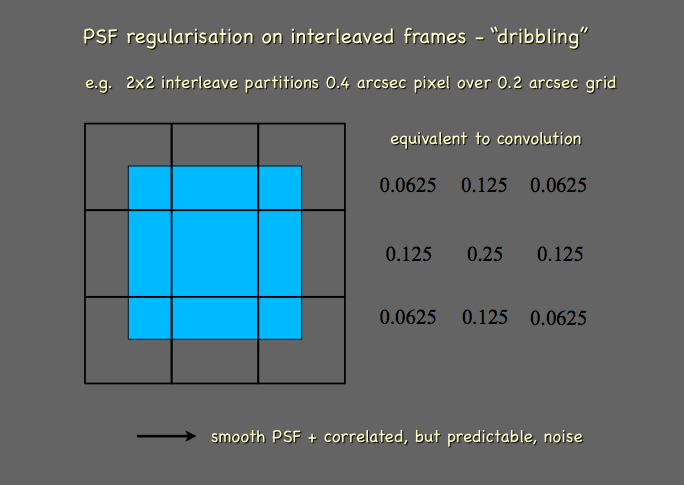 So in effect, neighbouring pixels actually overlap, and we can "dribble" these "big" pixels onto the underlying grid. This is straightforward to implement and at the same time the confidence map can be used to weight the dribbling process and be in turn equivalently dribbled. The correlated pixel noise is not a problem since it is entirely predictable and hence accountable for in subsequent error analysis.